November is National Native American Heritage Month. It’s a time to celebrate rich and diverse cultures, traditions, and histories and to acknowledge the important contributions of Native people. Long before Yellowstone became a national park, it was a place where Native Americans had a traditional connection to the land and its resources. They hunted, fished, gathered plants and obsidian, and used the thermals for religious and medicinal purposes. The first documentation of Native Americans in the Greater Yellowstone area was around the 1400s to 1700s by the Kiowa and later ancestors of the Blackfeet, Cayuse, Coeur d’Alene, Bannock, Nez Perce, Shoshone, and Umatilla. In subsequent years, tribes came to various regions of the park for different purposes. The Crow generally occupied the area east of the park, the Blackfeet the area to the North, and the Shoshone, Bannock and other tribes traversed the park annually to hunt on the plains to the east. Some tribes also used Fishing Bridge area as a rendezvous site. In total, there are 26 current tribes that have historic connections to the lands and resources now found within Yellowstone National Park. 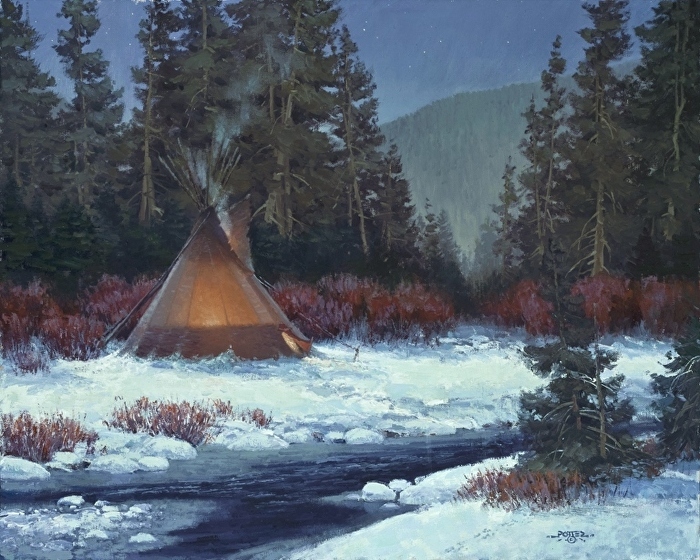 Art has been used to express the Native American way of life for hundreds of years. Early Native American art often was created as a symbol with materials varying from rocks, feathers, cloth, clay, and fabric. 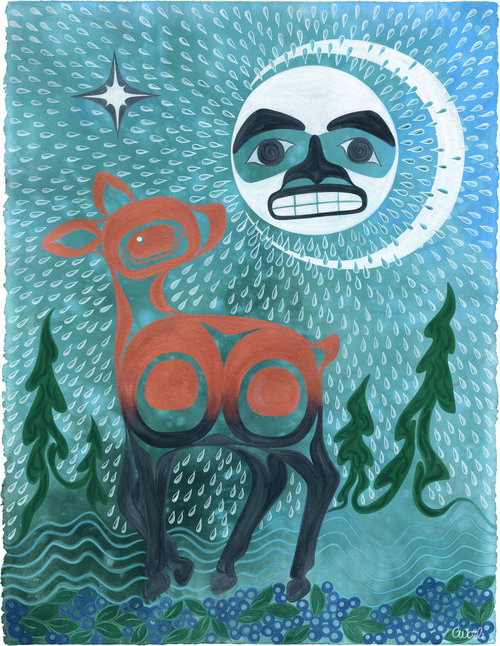 Today art still has an important place in telling the stories and representing the rich culture and connection to the land. 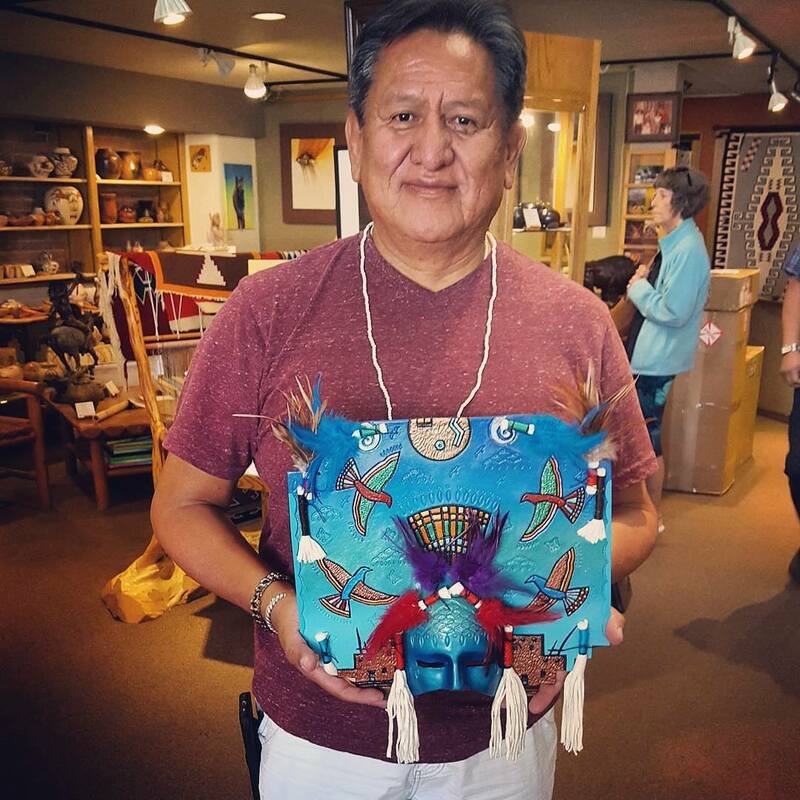 We’re proud to work with a number of talented Native American artists in Yellowstone. Learn more about their stories and art below. Traci’s work captures a spirit in the Native American woman that embodies the best in female strength. From the proud lift of her chin to the strands of hair caught by the wind, she appears to weather all storms. Her paintings represent the way it feels to be female; to fly in the face of all that comes, with dignity, energy and strength, they also capture women’s ability to be gentle, yielding, kind, and compassionate. She is also daughter to Cherokee National Treasure & Internationally known artist Bill Rabbit. James is a 1984 honors graduate of the Institute of American Indian Arts of Santa Fe, New Mexico. He has also attended the Parsons School of Design in New York City. Peter Ray James introduced his art to the competitive Indian Art world in the spring of 1988. Since then he has sold a little over 1,200 masks and 900 canvases. His art has been on album covers, prominent art show posters, and numerous newspaper and magazine covers. His celebrity collectors include Ahmad and Phylicia Rashad, Ted Danson, John Bon Jovi , and Wynonna Judd. “I am known among my Navajo people as Nahat’a Yilth Yil Wood, One Who Delivers the Message.” It is my Navajo name that braids many generations of prayers, symbolism, tradition, honor, knowledge, and love. I truly believe my destiny is to be a storyteller through my artist endeavors. I am always honored and respectful to represent my family name in my homeland and abroad”. Project Indigenous, founded by Scott Frazier, provides quality educational programs that teach from an Indigenous perspective through the humanities (storytelling, dance, music and hands on activities). Mr. Frazier is a Crow Tribal member but considers himself a Santee survivor because his grandfather was a full blood Santee. With decades of experience in the environmental arenas, he focuses on fields relating to the preservation and respect for Native lands, natural resources and Native cultures. Interconnection of Earth, Fire, Air and Water makes all things important to Mr. Frazier’s concern. 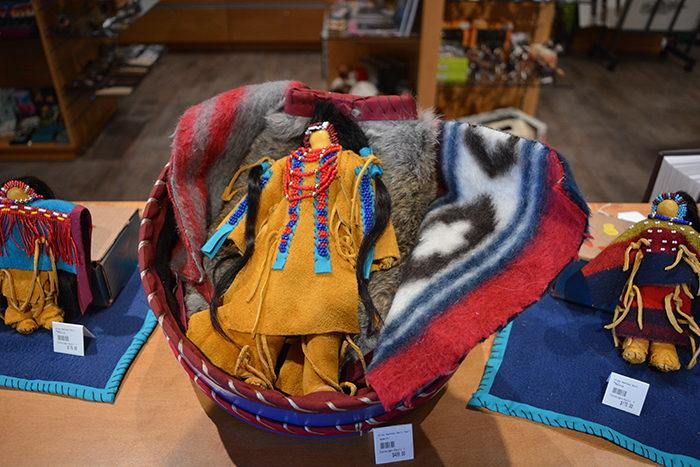 Bringing understanding and insight to a wide cross-section of the general public is the primary goal for all programs presented by Project Indigenous. Many years ago Mr. Frazier was asked to form a non-profit to secure Traditional Ceremony. He formed Ehnamani (A name was given to him by his grandparents) as a 501c3 to validate traditional ceremony through a government record of measure. This measure is to help others while being able to participate as a representative for Indigenous people world wide. Mr. Frazier was taught to do good work for the people. Project Indigenous and Ehnamani are examples of that teaching. 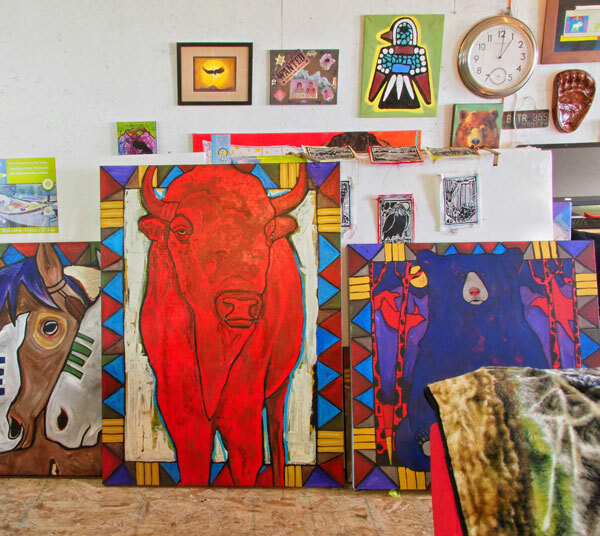 Artist John Potter was raised in the Upper Great Lakes country – on and off the Lac du Flambeau Ojibwe Indian Reservation in northern Wisconsin – where he grew up with an abiding love for the Natural World in the forests of the Great Northwoods. He often paints en plein air, bringing his small outdoor studies home, where they are then used as reference to create his larger studio works. Working directly from Nature, he firmly believes in the all-pervading Divinity found in the Natural World, and is always striving for an honest expression of light and color. John spends many hours in the field, observing and studying light, mood, atmosphere, the land and sky. He carries paints and a sketchbook whenever possible, travelling extensively – but his favorite subjects remain the rugged mountain scenery of the American West. Contemporary Native American Artist DG House of Bozeman, MT has had her work exhibited in the finest art museums including the Yellowstone Art Museum and the CM Russell Museum in Montana as well the Heard Museum in Phoenix, AZ, and the Eiteljorg Museum of Indians and Western Art in Indianapolis, IN. Her work is in permanent collections worldwide including rock stars Sir Elton John, Sir Paul McCartney, Michael McDonald, and the Smithsonian Institute’s Museum of the American Indian in Washington, DC. When asked about Yellowstone’s inspiration on her and her work, DG says, “Be careful, it can change you. Yellowstone completely inspires everything I do, including moving halfway across the country to be there.” It inspired her choice of career, first becoming a photographer and then a painter. DG wants her work to, “give voice to the people and wildlife of Yellowstone that don’t have a voice in this culture” and “remind the viewer of what they felt when they were in the park.” Read more about DG House.